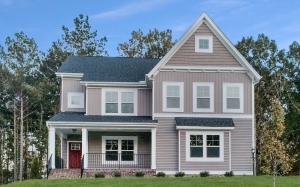 A Farmhouse style elevation on one of our most popular plans, The Winchester. Located in Harpers Mill – Timberstone, this new home in Chesterfield, VA is located in the Cosby High School. Hardwood floors and custom trim carry through the first floor. The extended Family Room with gas fireplace is open to the Kitchen with white cabinetry and granite countertops. A spacious room on the first floor could be a great Home Office or a Kids’ Playroom. Large walk-in Pantry is perfect to maximize storage in this fabulous Kitchen! On the second floor, the Owner’s Suite is designed with two walk-in closets and the Luxury Bath option. Beautiful ceramic tile in the shower and surrounding the soak tub make for a luxurious experience. Additionally, on the second floor are a Loft – great for gathering or for retreat, three additional Bedrooms, a Full Bath and Laundry Room. Going up, is a finished third floor with a full bath and additional bedroom. Paver patio and concrete parking pad are also included with this home. Photos are of the model home of the same floor plan.